Name three things that you see in this picture. Do they remind you of anything? This work of art includes two very different scenes. Describe each one. Why do you think they are shown together in the same picture? Look at how the woman in the picture is standing. Now you stand that way. How do you feel in that pose? What words would you use to describe this picture? Take a moment to look carefully at this artwork. It is called a lithograph. Lithographs are copies of original art, made by a special kind of printing process. 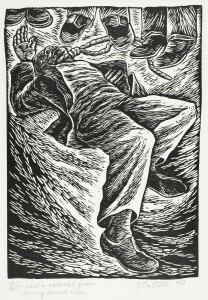 Lithographs can be printed in black and white or in color. What colors do you see in this lithograph? The yellow and orange are called warm colors, and in this artwork you can see them in the top half. White and blue are used in the bottom half of the work. Unlike yellow and orange, blue is a cool color. 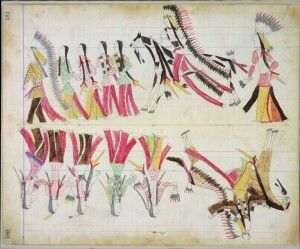 In this work, the artist chose to move down the page from warm shades to cool ones. The artist who made this work placed buildings in both the top and bottom parts of the picture. The buildings in the top half appear incomplete compared to those in the bottom half. In the center of the artwork stands a female figure. Maybe she reminds you of superheroes or comic book characters. She is drawn using the color gray, which makes it look like she is made of stone or cement, like a statue. Although we don’t know anything about the artist who made this work, we do know a lot about what he or she chose to draw. By reading the writing at the top, we can figure out that the place is Chicago, and that the date is October 9, 1893. This is the cover of a newspaper supplement. Inter Ocean was the name of a newspaper that was printed in Chicago in the 1800s. The name comes from Chicago’s location in the middle of the country, in-between the Pacific Ocean to the west and the Atlantic Ocean to the east. The newspaper printed this special artwork in honor of two important events in Chicago’s history–the 1871 fire and the 1893 World’s Fair. People who bought the newspaper would get a free copy of this work of art to keep as a gift or souvenir. The top of the artwork shows a scene of a fire. The buildings are burning. Yellow and orange flames swirl around them, and the gray sky makes us think of smoke. On October 8, 1871, a barn in Chicago caught on fire and the fire quickly spread out of control. Over the next few days, a large part of the city burned. This event became known as the Great Chicago Fire. The bottom of the artwork shows many large, white buildings. These buildings were once on the South Side of Chicago in Jackson Park. Although they look old to us now, they were actually brand new at the time this newspaper was printed in 1893. They were built for a special event called The World’s Columbian Exposition, also known as the Chicago World’s Fair of 1893. World’s Fairs were held to show and share art, culture, food, new inventions, and products from all over the globe. Visitors traveled to the fair from many different places to see what was inside all of those giant buildings. Chicagoans were very excited that the fair was in their city, and they wanted it to look beautiful for all of the people who were coming to visit. 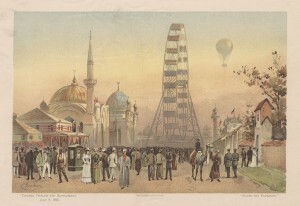 The woman in the middle of the artwork was the mascot of the 1893 World’s Fair. She was called the “I Will Maiden.” Maiden is another word for woman. The “I Will Maiden” is wearing interesting clothing, especially her helmet with a phoenix on top of it. The phoenix isn’t a real bird. It is a mythical animal that the ancient Greeks and Romans believed in. According to their stories, at the end of the phoenix’s life, it catches on fire and turns to ashes. Out of the ashes, a new, young phoenix is born to live another long life. The “I Will Maiden” was seen all over the fair. Her image appeared as statues, was printed on maps and guidebooks, and was drawn or painted in artworks. 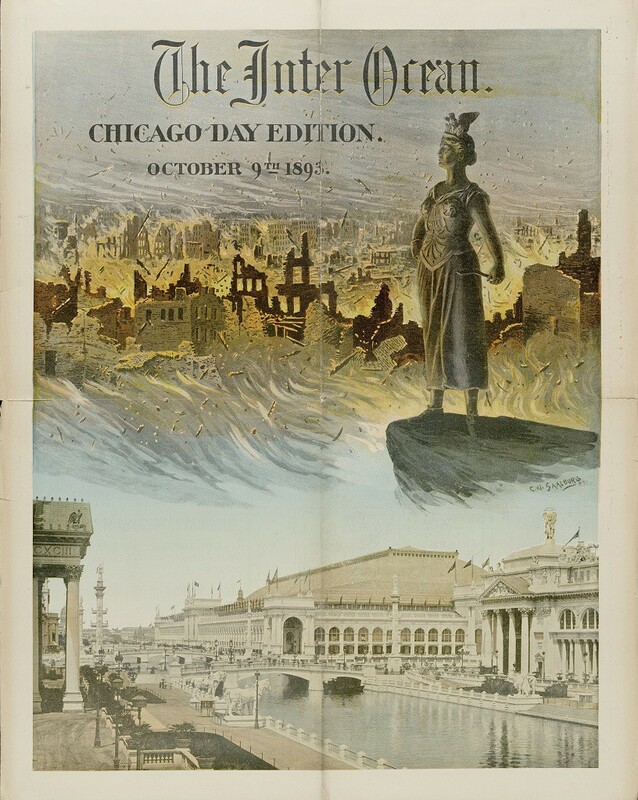 In this image, she watches over the city like a superhero, both in the past at the time of the Great Chicago Fire, and during the exciting time of the 1893 World’s Fair. This artwork tells us about two very important stories in Chicago history and sends a positive message for the city’s future. Like the phoenix that rises from its own ashes, the city of Chicago was born again from the burnt buildings of the Great Chicago Fire to hold the World’s Fair of 1893, just twenty-two years later! How does the change in colors from top to bottom make you feel when you look at the work? What clues in the image tell you that this picture is from the cover of a newspaper? 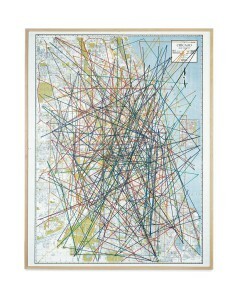 Pick out some different kinds lines that the artist used to make the buildings in both the top and bottom. Can you find straight, vertical, horizontal and jagged lines? What shapes do you see in the buildings? Can you find curves, rectangles and squares? How do the lines, shapes, and colors help your eye move around the artwork? What do these different lines, shapes, and colors communicate? The word “will” is short for willpower, the determination to carry out important wishes and plans. What plans do you think the “I Will Maiden” had for Chicago? If you made an artwork to show two important events from your life, what would you choose? Why? Peck, Richard. Fair Weather. New York: Dial Books, 2001.